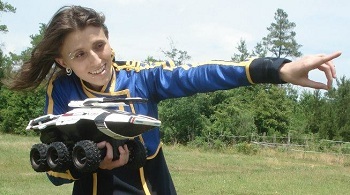 A talented fan makes a remote-controlled Mako, complete with rotating turret. The M-35 Mako. Love it or hate it, its iconic design embodies the Mass Effect aesthetic. It only appeared in the first game, but that was enough to capture the imagination of self-proclaimed "jack of all trades" Laura Ducros, who cobbled together a remote-controlled Mako of her very own. You don't need jump jets or an element zero core to be awesome, just some craft foam and a lot of heart. After seeing remote-controlled R2D2's and K9s at various conventions, Laura wanted something similar to accompany her FemShep outfit. Lacking access to the proper futuristic materials, Laura had to construct the rover out of craft foam, a wooden dowel, and lots of superglue. The base was salvaged from a 6-wheel RC truck from Target, and the body is patterned after a papercraft model by ThunderChildFTC. In all, it measures 19.5" long and 8" tall. The turret even rotates on command. The only thing it needs are a few papercraft Geth soldiers to run over. You can find more details on the RC Mako at the official Bioware blog. Laura's not finished with it yet, as she plans to keep updating the project with lights, a functional cannon, and maybe even a jumping ability. You can keep tabs on the project via its own Facebook page.